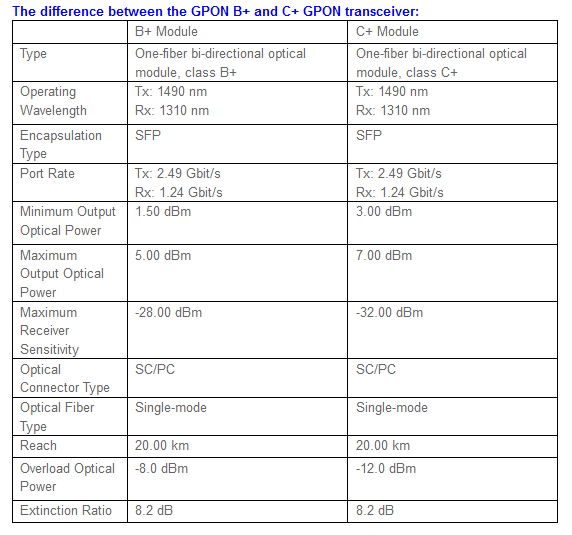 The Key Differences Between GPON SFP Class B+ and C+ are their TX power and RX Sensitive. Class B+ OLT transceiver: TX power 1.5~5db, RX sensitive -28db. Class B+ ONU transceiver: : TX power 0.5~5db, RX sensitive -27db. Class C+ OLT transceiver: TX power 3~7db, RX sensitive -32db. Class C+ ONU transceiver: : TX power 0.5~5db, RX sensitive -30db. Is B+ SFP in gpon OLT compatible with C+ ONU? Will it register? Hi,usually I was using pon sfp modules for my epon OLT,when I tried with normal 1490/1310 sfp,found it is working with onu.Any pblm if use this way ? Can we use C+ SFP in olt compatible with B+ ONU? how acn i know the launched power with out use the CLI command in olt? what equipment i should use? what is the messurement in that equipment , minimun 1,5 dbs ? Hi Shahed, this is only aplicable to GPON and not for GEPON really? ?